Are you in the market for a full=size luxury sedan? At Ross Motor Company, our team suggests the Chrysler 300. It is a popular vehicle with consumers because it offers a wide range of features, which include exterior features that give the 300 contemporary styling that stands out among the rest. The 300 offers an available S Model Appearance Package. This package comes with body-color fascias and signature Daytime Running Lamps, sculpted sill moldings, premium LED fog lamps, and a body-color rear spoiler. If you want a light-duty pickup truck, you have many options to choose from, but our team at Ross Motor Company thinks the Ram 1500 is an exceptional model. Many consumers choose the Ram 1500 because it comes with next-generation features that enhance capability. The Jeep Gladiator is an all-new midsized pick-up truck. Slated to be released in spring 2019, the Gladiator is a powerful, efficient truck with a unique aesthetic. This truck has been designed with care to exceed the expectations of consumers. The new Gladiator is a powerful truck, capable of towing up to 7650 lbs depending on configuration. Right from the jump, this truck is the leader in its class. The Trailcam off-road camera gives drivers an advance view of possible obstacles. Are you interested in the Jeep Renegade? If you are, this SUV comes well-equipped with a wide range of innovative features. At Ross Motor Company, we like to help our consumers understand the features that come with our models, so you can read about a couple of capability features that are equipped with the Renegade. One type of leak you'll want to watch for is a coolant leak. When a vehicle's coolant system springs a major leak, it can cause the engine to overheat or even be damaged beyond repair. Engine coolants have distinctive green or orange colors. The Ram 2500 is a popular heavy-duty truck at Ross Motor Company. This pickup truck offers drivers a number of features. With the Ram 2500, you can choose between three engines and two powertrains. The 5.7L HEMI V8 engine comes equipped with Variable Valve Timing (VVT) that maximizes torque over a large RPM range. This engine is capable of 383 horsepower and 400 lb.-ft. of torque, and it is also capable of towing up to 13,980 pounds. The 6.4L HEMI V8 engine offers best-in-class horsepower and towing capability. Pickup trucks have enjoyed great popularity throughout their history and are likely to maintain this status well into the future. This popularity exists for many reasons including superior interior space and eye-opening performance metrics. Here at Ross Motor Company, we enjoy helping our customers to identify metrics that help them make more informed buying choices. Many people associate roomy vehicle interiors with SUVs and minivans, but many modern full size pickup trucks offer more room than either of these vehicle styles. Are you looking for a reliable cargo van/passenger wagon? 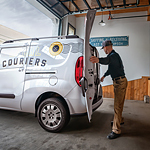 If so, the Ram ProMaster City is a versatile van that can offers several configurations to meet your needs. You can check out the ProMaster City at Ross Motor Company, and below you can read about a few of its capability features.